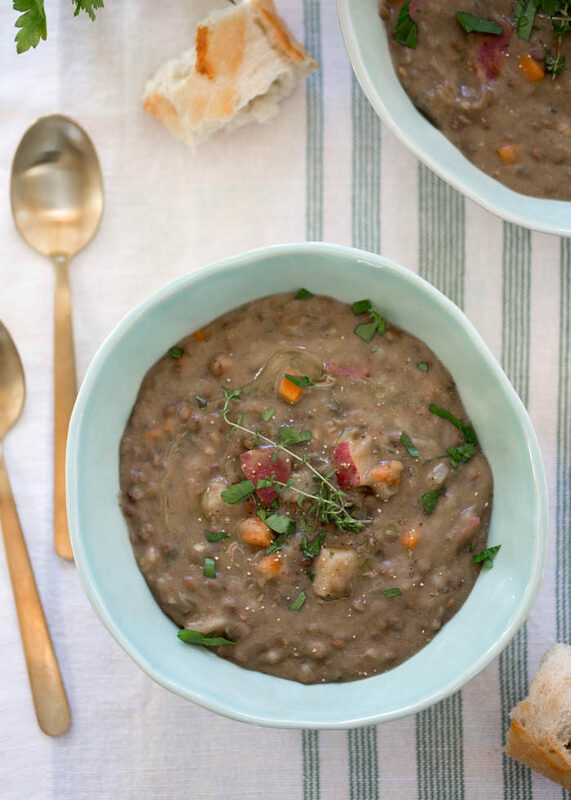 This rib-sticking lentil soup whips up quickly and easily right in your Instant Pot. With red potatoes + fresh thyme and tarragon, it’s creamy, hearty, and full of flavor. A new fave around here! 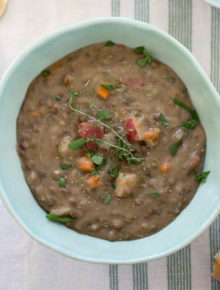 Pretty much as soon as the Thanksgiving leftovers were gone, I found myself obsessing over lentil soup. Something about the healthy + the hearty appealed to me – and, of course, even better when made in the Instant Pot. 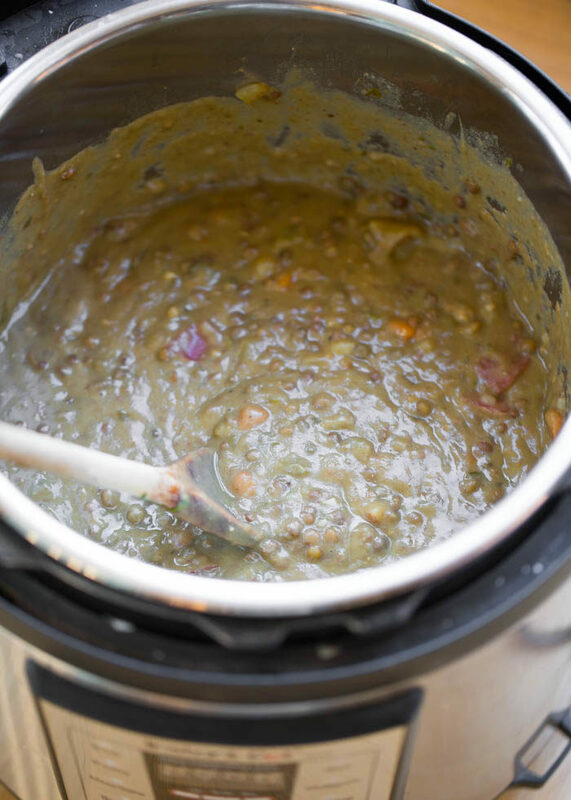 As it turns out, Instant Pot lentil soup hasn’t only been on my mind – it’s been on others’ minds as well. This Instant Pot golden lentil soup was the most-viewed recipe on Kitchen Treaty last week. 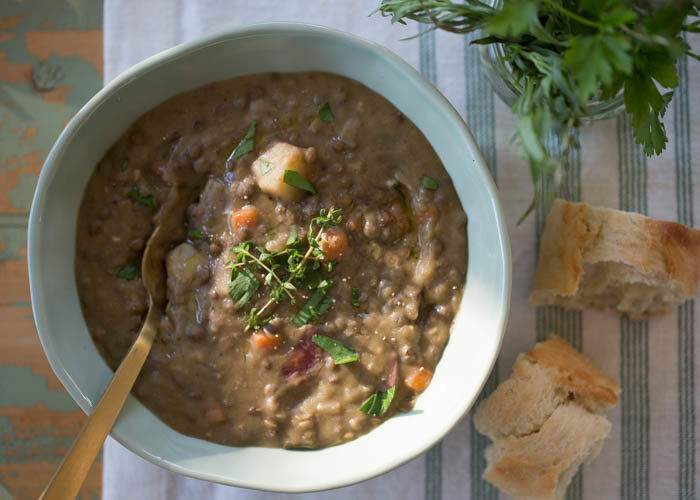 It’s officially a good time for lentil soup! Never one to leave well enough alone, I decided it was time to come up with another recipe. This one, loaded up with red potatoes, fresh thyme, and heady fresh tarragon, is so thick and hearty it’s almost more of a stew than a soup. Either way, it’s absolutely comforting and satiating and full of flavor and it’s a new fave. 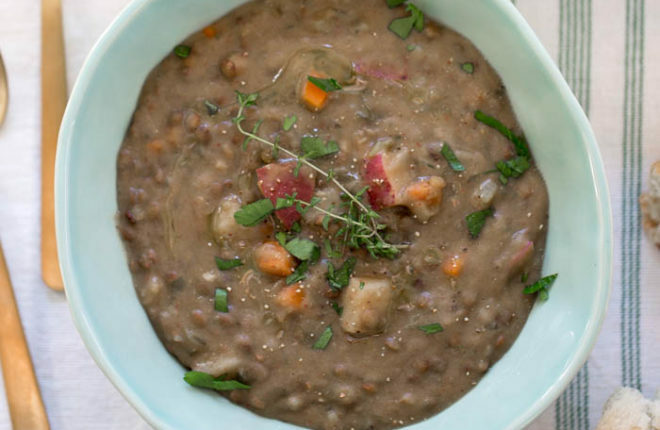 I love French green lentils (also known as lentilles du Puy) – unlike some varieties of lentils, they keep their shape marvelously when cooked and hold up to what the Instant Pot dishes out. 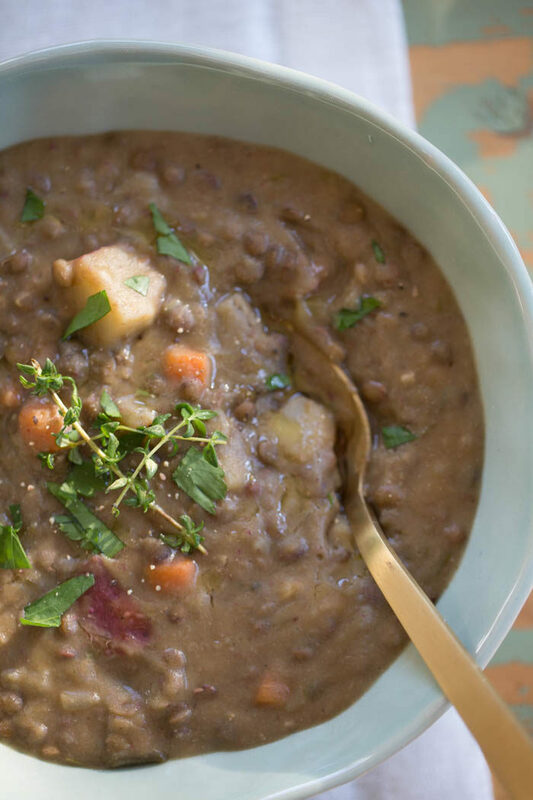 They also taste just a bit different than your average lentil – a bit more earthy, I suppose. Hearty. Rustic. Delicious. Set Instant Pot to saute. Add olive oil. When warm, add onion, carrots, and celery along with a pinch of salt. Cook, stirring occasionally, until softened, about 8 minutes. Add the garlic and cook, stirring, for one minute. Add the vegetable broth, potatoes, lentils, tarragon, parsley, thyme, 1/2 teaspoon salt, and 1/8 teaspoon pepper. Stir. Place lid on Instant Pot and make sure the release valve is in the “sealing” position. Press the “Manual” button (or “Pressure Cook” button on newer models) and set the timer for 10 minutes. The Instant Pot will warm up for a few minutes and then begin cooking. After the time is up, quick-release by flipping the valve to “venting,” being careful to avoid any steam burns. When the venting is complete, remove the lid of the Instant Pot. Remove the thyme stems. Transfer two cups of soup to the pitcher of a blender and puree completely. Return to the Instant Pot. 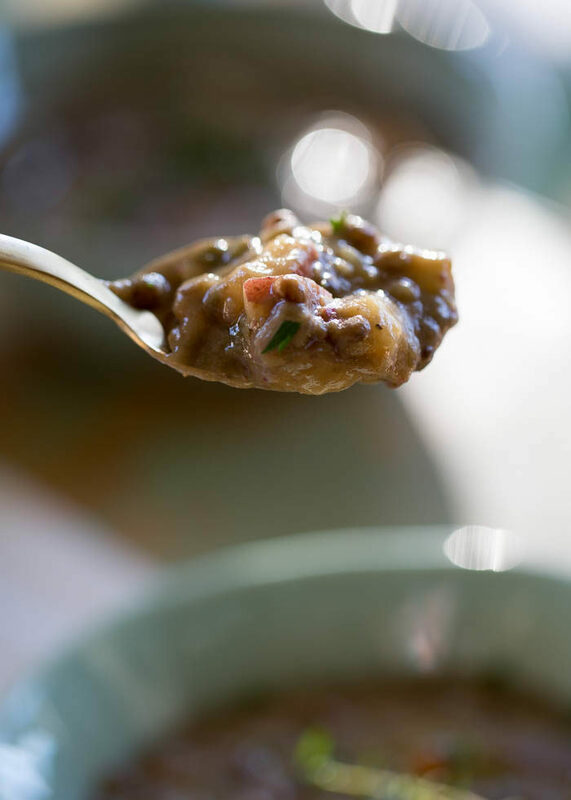 (This step is optional but recommended – it results in a creamy, extra-hearty soup). Stir in the lemon, taste the soup, and add more salt and pepper to taste. Serve topped with a few extra fresh herbs and a drizzle of olive oil if desired.